Framagraphic Custom Picture Framing has framed a lot of Roy Henry Vickers prints over the years. 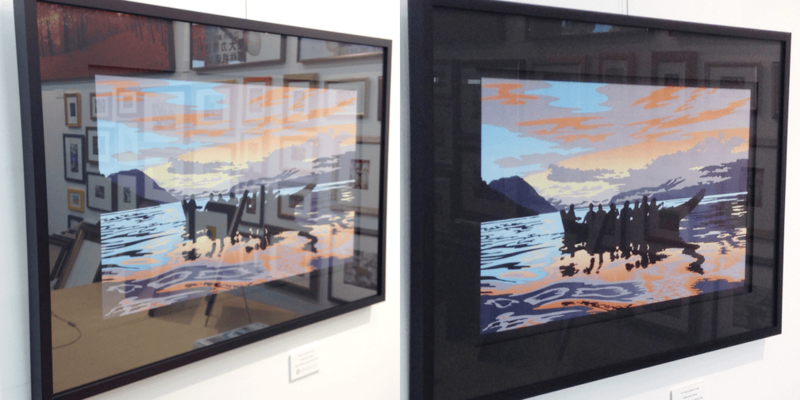 In fact Framagraphic is recommended by the Vickers Eagle Aerie Gallery in Tofino. People usually choose to have their Roy Henry Vickers prints framed in the same manner as they are displayed in his gallery: a black metal frame with a 4-inch double black mat and UV glass. This combination really does make the colours in a Vickers print ‘pop’ as we say. All of the Vickers prints we frame are done according to the picture framing guidelines that accompany each print. Roy recommends using Conservation Clear UV glass to reduce fading. This type of glass looks much like regular glass although it has a slight orange cast to it. This glass blocks 99% of the UV light hitting the artwork. Humans cannot see UV light so we might as well block it from hitting the artwork. Blocking out that UV light will reduce the art’s fading by that much. The new thing in picture framing these days, however, is a kind of glass that is almost invisible. It’s called Ultra Vue Glass by Tru Vue. This kind of glass is especially good when used on things framed with a lot of black –like something framed in the Vickers style. The issue is that when you put glass in front of black matting, the effect is like creating a mirror. The black background creates a lot of reflection in the glass. For this reason many of our clients are now choosing to go with Ultra Vue Glass on their Vickers frames. The clarity of this glass is amazing. It is almost invisible –even with a black background. Ultra Vue Glass comes in 2 varieties with 70% or 92% UV blocking properties –compared to the 99% of Conservation Clear UV glass that the Eagle Aerie Gallery recommends. A little less UV blocking but amazing clarity. For full protection you can go with Museum glass –which has similar clarity along with full 99% UV blocking properties. These types of glass are more expensive than Conservation Clear UV glass, but many of our clients agree the extra investment is worth it to preserve framed art for years to come.